Sage Garden Project is assembling a group of like-minded funders to support and sustain school garden and nutrition education programs in California schools. We are delighted to announce Sprouts Healthy Communities Foundation as our first partner! With a special interest in building capacity for cooking, Sprouts is underwriting the cooking carts we supply to Grow Package recipients, and providing funds for schools to purchase their own garden and grocery supplies. Sprouts will also be matching our contributions to schools that are struggling to maintain their programs after the initial three years of Sage Garden Project support. Grow Package Award recipients will have this well-made piece of science furniture shipped to them, ready to assemble. They will also receive a generous collection of the basic tools and equipment needed to begin cooking in the garden or classroom. We’ve done our best to provide an entire kitchen inside this portable cart. 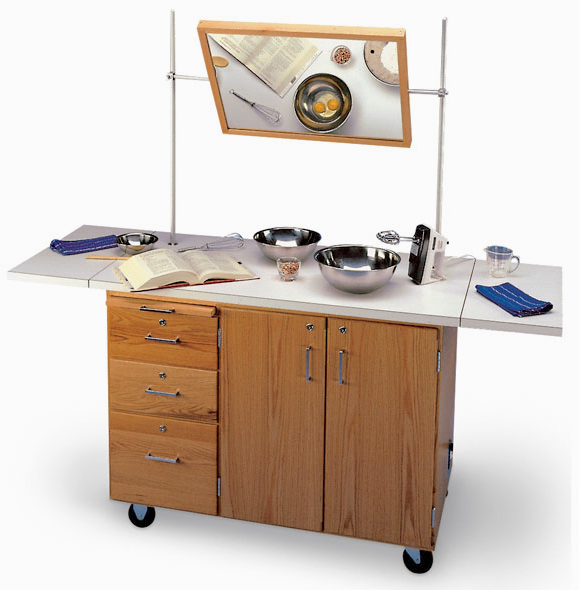 Add an outlet and your classroom sink, and you should be able to provide a world of nutrition lessons to your students. We’ve supplied everything you’ll need for 12 students, a helper, and an instructor. All you should have to add is produce from your garden and a few groceries. Easy-to-follow instructions for the complete garden-to-table experience. We’ve compiled some of our students’ favorite recipes that can be created with the cooking cart, and provide lesson books to give you lots of ideas. Your students will love preparing healthy garden-fresh dishes with you!